One of the earliest arcade games to use vector graphics, i.e., 3D images made from just lines with no colourisation. Guide your tank through obstacles whilst trying to stay out of the line of fire of you adversaries. The winning tactic is simple, make sure you get that crucial shot in first. 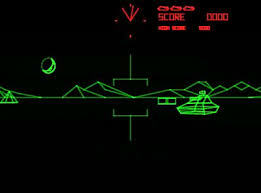 This game was so popular that the U.S. Army asked Atari to build a custom vesting of the game which would enable their soldier to train to operation the M-1 Abrahams tank. One prototype was made, but never released. However, elements of the controls used for the prototype would be used in later games, such as Road Blasters.